Trailer promises "a glimpse of what it was like inside"
It took 69 days before the Chileans famously trapped in a mine were rescued last month, but only 26 days for the first movie about the event to be sold. The sale of "The 33 of San Jose" took place at the ongoing American Film Market, an annual entertainment industry deal fest held in Santa Monica. The film, made by Antonio Recio, went into pre-production three weeks before the rescue that captivated the world took place. The American Video Films company has already sold theatrical, TV and DVD rights to the film to two foreign distributors and says they are talking with studios in the U.S., the U.K. and Japan, among others, about additional sales. A trailer for "The 33" was shown at AFM for the first time. It features the 32 Chilean actors and one Bolivian actor in footage taken not far from where the real miners were trapped. "You've seen the outside," the trailer intones. "Now take a glimpse of what it was like inside." 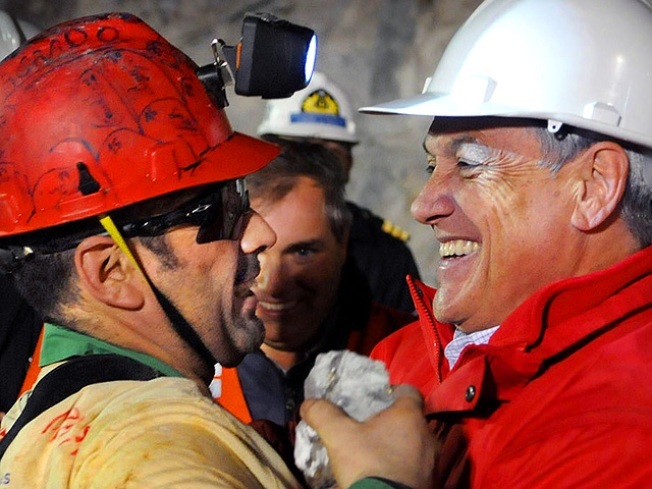 In real life, some of the miners have been on media blitzes of their own. The breakout star so far has been Edison Pena who, last week, charmed David Letterman and yesterday ran the New York Marathon in five hours and 40 minutes. News of the casting of "The 33 of San Jose" should assuage the fears of those that worried this story would get the Hollywood treatment. Those concerns were addressed in a brilliant YouTube video parodying Tinseltown's talent for packing every story with as many A-list (or B or C-list) stars as possible. For now it looks like neither Tom Hanks, Leonardo DiCaprio, Tom Cruise or any of the other 30 Hollywood heavies featured in that clip will star in "The 33 of San Jose." That makes the swiftness of the film's sale even more remarkable. Selected Reading : The Hollywood Reporter , Newser , New York magazine .